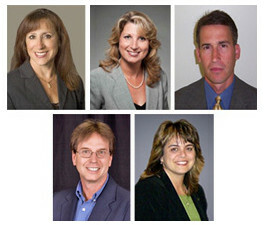 The New York Credit Union Foundation board of trustees appointed their officers during a June 11 meeting in Bolton Landing, New York. The meeting took place during the first day of the New York Credit Union Association's 2015 Annual Meeting & Convention. Robyn Young, CEO of Great Erie FCU, will continue to serve as the Foundation's chair, and Catherine Benson, chief of lending at CFCU Community CU, will again serve as vice chair. John Felton, manager and CEO of Southern Chautauqua FCU, was named the board's secretary and treasurer. New trustees include: Cristina Morrissiey, financial center manager at AmeriCU Credit Union, and Cara Babicz, loan officer at Great Erie FCU. Babicz previously represented the Foundation's board of trustees as the representative for NYCUA's Young Professionals Commission, which is tasked with recruiting young adults as employees and volunteers and advancing them into positions of leadership within the New York credit union community. Terri Oakland, technology services coordinator at TCT FCU, will serve as the Commission's new representative. "Our board of trustees believes in the credit union movement and believes in the Foundation," said Foundation Vice President Allison Barna. "Together, with the board's leadership and guidance, we will continue to advance our cause and foster the financial independence of all New Yorkers." The New York Credit Union Foundation board of trustees appointed their officers during their June 19 meeting in Saratoga, New York. The meeting took place during the first day of the Credit Union Association of New York's 2014 Annual Meeting & Convention. Former Vice Chair Robyn Young, CEO of Great Erie FCU, has been named the Foundation's new chair. Catherine Benson, chief of lending at CFCU Community CU, will assume the duties of vice chair, and CUNA Mutual Group Sales Manager Chris Guild was elected to serve as the board's treasurer and secretary. Two new trustees—John Felton, manager/CEO of Southern Chautauqua FCU, and Jody Carpenter, VP of marketing and business development at UFirst FCU—were also named to the Foundation board. "The Foundation and all of those who benefit from the Foundation's work are privileged to have such dedicated and capable professionals leading our board of trustees," said Vice President Allison Barna. "I'm confident that the Foundation will continue to excel in fostering the financial independence of all New Yorkers under their leadership."